No cooking needed! These lovely, refreshing treats are easy to make and great for an activity with the kiddos in the kitchen after-school. Just a whirl in the food processor and the mixture is ready to go! Place dates, walnuts, sesame seeds, lemon juice and zest in a food processor. Pulse and blend until completely mixed. The mixture will be slightly sticky. 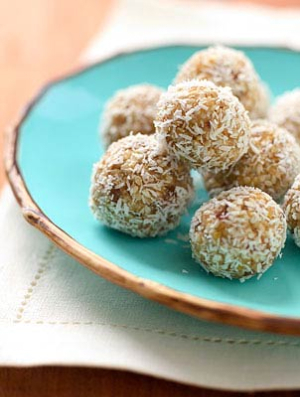 With dampened hands, roll tablespoons of the mixture into balls. Roll in coconut and chill until ready to serve.